George M. Dennison was President of The University of Montana, 1990-2010. During his years as President, the University increased its funded research seven-fold; raised in excess of $500,000,000 in the private sector; awarded more degrees that during its entire previous history; roughly doubled the space on campus for teaching, research, student housing, and athletics; and recruited a faculty capable of making these achievements. During his tenure, he assisted in the restructuring of the Montana University System and as President for 15 years of one of the two resultant multi-campus Universities comprising the new System. Dennison served in various faculty and administrative roles and capacities during the years from 1967 until his retirement in 2010. Beginning his career as a faculty member at the Universities of Arkansas, Washington, and Colorado State University, he served as Associate Dean, Acting Academic Vice President, and Associate Academic Vice President of Colorado State University, 1975-1987; Provost and Vice for Academic Affairs, Western Michigan University, 1987-1990. In addition, he served two terms on the Northwest Commission of Colleges and Universities, two terms on the Board of Directors of The Campus Compact, roughly a decade as a member and Chair of the International Student Exchange Program (ISEP), four years as a member of the National Security Education Board, and for many years as an active member of ACE and APLU -- formerly NASULGC. 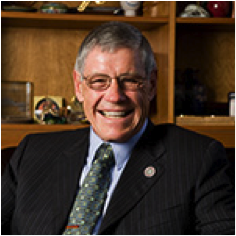 Following retirement in 2010, he served in 2011-2012 as Chief Academic Officer for the Colorado State University System.